This post is part of my series on Nicholas Everitt's The Non-Existence of God. For an index, see here. The first two chapters of Everitt's book are about the role of reason in the debate about God's existence. It would be nice if we could agree that logic and evidence are the tools with which we examine the legitimacy of God-belief, but we can't. As we saw in the summary of chapter 1, many religious thinkers object to the use of logic and evidence when it comes to God. Everitt dismisses these objections with, I would argue, considerable aplomb. Chapter 2 of Everitt's book deals with a slightly more sophisticated criticism of logic and evidence. This is the argument in favour of a reformed epistemology, which is associated with the work of Alvin Plantinga. Let's see what this means. Daniel Dennett's Philosophical Lexicon offers an amusing take on contemporary philosophy. It has the outward form of a dictionary, but inside beats the cold heart of satire. Each entry in the lexicon turns the surname of a leading figure in contemporary philosophy into a noun, verb or adjective. The definitions of which ridicule the opinions the philosopher. This gives us a pretty good idea of what Plantinga's reformed epistemology is all about. It dresses up an old argument in the trappings of modern analytical philosophy. That's no real criticism, but it works well as a rhetorical cheap shot. Plantinga's argument is essentially the following: belief in God requires no rational justification because it is properly basic. To see what this means we need to look first at foundationalism and basic beliefs. Do you believe that Barack Obama is president of the United States? Unless you are a member of the bizarre "birther" group, I presume that you do. Now ask yourself: why do you believe this? Maybe its because you were present at his inauguration and saw him being sworn in (admittedly mistakenly the first time round). But why does this support your Obama-is-president belief? Presumably because you already believe in the legitimacy of the November 4th election and the authority of the U.S. constitution. But why do you believe those things? We could play this game for quite some time. It seems that for any particular belief we care to have, there is huge supporting cast of supplementary confirmatory beliefs? Do these beliefs rest on anything more substantial than yet more beliefs? This is a key question in epistemology because it deals with the concept of justification: what are you justified in believing? There are two schools of thought on the matter. First, there are the coherentists. These peculiar specimens argue that there is nothing substantial supporting your Obama-is-president belief. There is simply a circle of beliefs, where each belief supports another, but no belief is more important than any other. Think of the game in which people sit on each other's laps in circular formation: if done properly, the circle is self-supporting. Second, there are foundationalists. 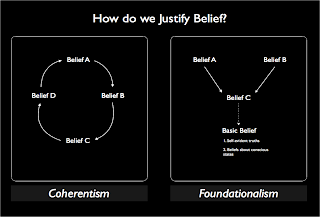 They reject the coherentist approach by arguing that a self-supporting circle provides no real justification. Instead, there must be certain foundational beliefs: i.e. beliefs that require no further justification. Such beliefs are deemed "basic beliefs". All other beliefs must be derived from them. Self-Evident Truths: any logical truths such as "If A=B, and B=C, then A=C", "All A is A", "If P then Q; P, therefore Q". Beliefs about Conscious States: for example if you believe you are in pain, your belief requires no further justification. Some foundationalists have been willing to extend this category to include sensations about the external world. In other words, my visual perception of a laptop in front of me at this instant could be considered a properly basic belief (but what about Macbeth's floating dagger?). Can Belief in God be Properly Basic? It would seem odd to suppose that God-belief is properly basic. The proposition "God exists" is certainly not a self-evident truth, but nor does it seem that we know God from immediate conscious sensation. This is where Plantinga's reformed epistemology enters the intellectual battlefield. As the name suggests, he wants to reform classic foundationalism in such a way that God-belief becomes properly basic. We will see how he tries to do this in the next post. I don't really like the concept of Basic Beliefs because there is no 'confidence' criteria, they seem Boolean. Nor do I, but you will have to educate me on what you mean by calling them Boolean. I'm not too au fait with formal logic. Do you mean the concept is too binary because something either is or is not basic? The discussion in Everitt's book is slightly frustrating in that it doesn't really make the case for an alternative epistemology. Then again, he's only interested in the merits of Plantinga's arguments: to explore such matters would be excessive in a work of this nature. I am too much of Quinean to be a fan of foundationalism. I'm reading some interesting stuff by Penelope Maddy at the moment on an anti-foundationalist, but naturalist epistemology. Might do a few posts on it once I am finished. By Boolean (1 or 0) I mean yes or no, not partially, mostly, etc. There is clear demarcation: it is Properly Basic or not, but the hurdle for being Properly Basic seems arbitrary and fuzzy, we descend into 'you know it when you see it'. For example, for water, hot is relative but boiling is absolute. Proper Basicality needs to be 'Boiling'. "One cannot function socially without it"
"It would be shared by 99.9% percent of the population"
these would seem to be as good as any, but Religiosity would fail. 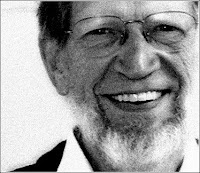 Plantinga perhaps cherry-picks with a goal in mind? Thanks for the link, keep up the excellent, must-reads blog. I think that is the biggest problem for Plantinga, i.e. it seems far too easy for him to sneak God-belief into the basic belief category. 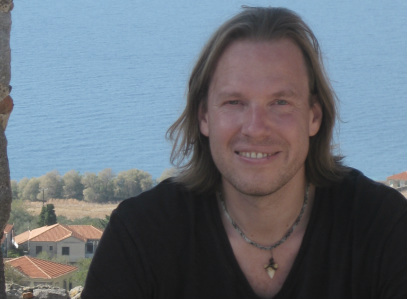 It is also rather infuriating given how he will respond to critics by saying the haven't fully imbibed the import of his arguments against classical foundationalism, What he seems to mean by this is that they are still using logical self-evidency or conscious awareness as the yardstick against which to measure all other beliefs. They haven't accepted that other beliefs need no justification. Maybe I am being unfair to him, but I think this reduces reformed epistemology to a type of Lutheran fideism (which i covered when looking at chapter 1 of Everitt's book). Luther thought reason was to serve God, not stand above him. Well, it seems to me that Plantinga is just putting God and reason on the same level. Thus rendering God-belief practically unassailable. "Thus rendering God-belief practically unassailable." this is of course, the objective, making the exercise a bit disingenuous..